It has been a very long and exhausting(ly boring) half a season of Once Upon a Time, Oncers. But we made it! We braved the Neverland forest of perpetual setbacks and sides stories. We survived the onslaught of emotional baggage from everyone from the unusual suspects (Snow & Charming) to we-expect-better-from-you characters (Rumple). Felix and fake Pan drop random vials of magic from Regina’s vault into Storybrooke’s well. But as we all recall, in order for the curse to work you have to supply the heart of the thing you love most. For Pan it’s not Rumple but Felix (a friendship/loyalty kind of love, just so we’re clear). The Lost Boy isn’t so sure about this plan and can’t we talk about this…Nope. He heart is ripped out and crushed into the well. This is all while Gold is explaining to the main cast that the new curse will follow Pan’s evil machinations, just like the old curse did Regina’s. The solution is twofold: First, switch Pan and Henry back to their bodies, which requires the Black Fairy’s wand. Second, get the scroll back and Regina can cancel the new curse. A plan in place the team breaks their huddle while green smoke billows up from the well. Credits. We are nearly at the end of this incredibly long (for us anyway) Neverland journey Oncers. Our heroes and some villains have returned to Storybrooke to reunite with all of the secondary character we know, love and miss. But of course, that wily Peter Pan keeps up his scheming even while trapped in Henry baby faced, yet suddenly much taller, body. 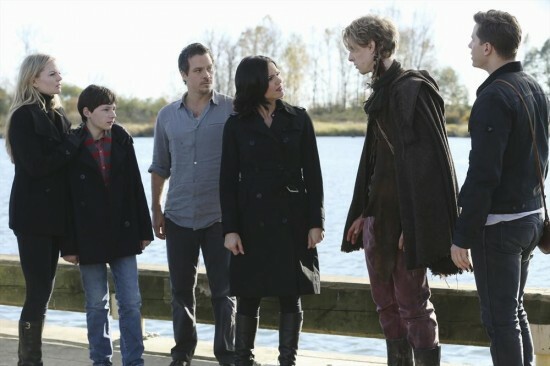 The episode opens on the quaint town of Storybrooke where nothing strange happens as long as everyone important is away. Belle takes Ariel to the docks where the mermaid instantly locks lips with hunky fisherman Eric. It feels appropriate to again point out that these two knew each for literally three minutes. But this is all just set up for the Jolly Roger to appear in the sky and swoop toward the dock. Credits. The whole town has instantly gathered to applaud the arrival of the people they earlier said they didn’t actually miss. While everyone else gets hugs and kisses, Regina stands all alone. Snow throws her a well-deserved bone by saying for all to hear that they made it back because of the Queen. Flashback to Regina interrupting the Charming wedding from the Pilot episode. After the ceremony, Snow is angry as hell about her big day being disturbed. Charming says the real way to stick it to Regina is to enjoy their honeymoon as soon as possible and I think we all know what’s really on his mind. The newlyweds share a genuinely cute scene together where Charming steals a kiss and I’m reminded that sometimes these two actually have on screen chemistry. Snow chooses the Summer Palace as their destination, later revealing privately to Grumpy that there’s something there that can help them defeat Regina. Oh and because the Once family tree wasn’t weird enough, Pan is Rumple’s crappy father and also trapped him in Pandora’s Box. 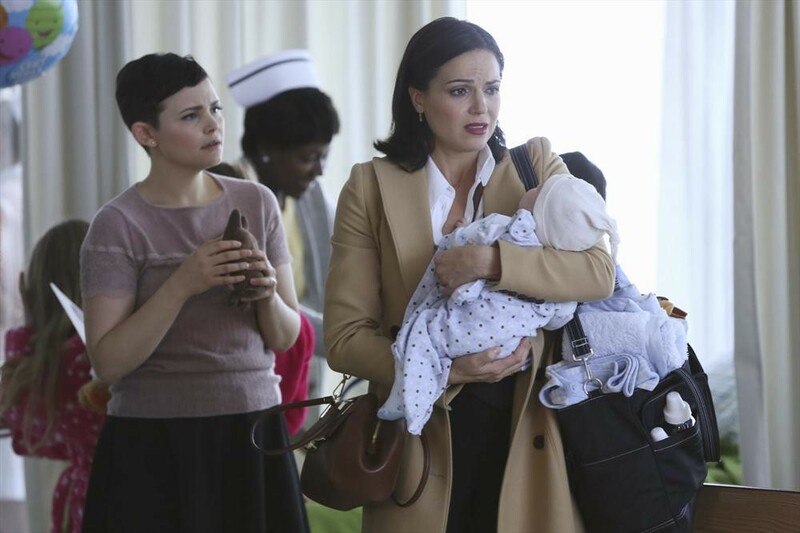 This week, Henry’s heart-lessness is resolved rather speedily, Regina remembers her maternal roots and out mothers both Emma and Snow, and Pan proves his much more than a one trick pony. We start with a flashback to the Enchanted Forest. The curse is billowing toward the castle and Regina poofs into the dungeon where Rumple’s being held. She’s come to gloat about having cast the curse, which really makes no sense because he egged her on to do it. He just wants to pour salt in the open wound that is Regina killing her father to cast the curse. As always, the Queen is masking her pain with swagger, saying she feels invincible even in the face of Rumple’s revelation about the Charmings’ savoir baby. He gets in one last dig before she skips off to gloat over Snow. “There’s a hole in your heart and someday you will come to me to fill it,” he sneers. Credits. In an incredibly surprising turn of events, there is once again forward momentum on Once Upon a Time! Henry’s family even finds the kid and we get a nice bit of background for my beloved Rumplestiltskin. Sadly, “Think Lovely Thoughts” is also so packed with contrivances it dulls the otherwise tasty plot developments. Everything from Pan’s origin story (especially the source of his name) to Henry’s inexplicable stupidity made me cringe, dear Oncers. But still we carry on, so let’s begin with a flashback, shall we? A card hustler gets beaten up and robbed after swindling one too many customers. His son tries to intervene with the help of his adorable eyes and precious Scottish accent but it’s no use. Dad is a deadbeat for poor baby Rumple. In Neverland, Pan reminds Henry that saving magic will save Wendy and everyone else. Henry, clearly being driven by hormones and a childish fantasy to be the hero like in his fairytale book, says he’s ready to do his duty.